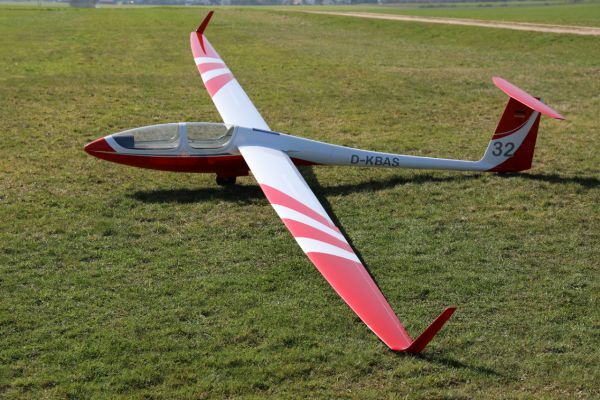 The famous Schleicher glider manufacturer is expanding its range by a new two seat high performance glider ASG32.It completes the range consiting of the well know ASK21 which was build over 900 times and the high performance ASH 30Mi for the open class. The ASG32 is especially designed for the more and more popular class FAI douple seater class. But the airplane is not only for the competition pilot. It will excite the normel club level pilot by its exceptional performance. The master model was made by Holger Höchsmann with the original plans form Schleicher. The master is a piece of perfection wheen it comes to the replication of the original. You cannot distinguish this model from the original if you are just a few meters away. The fuselage was designed to be parted. This makes it very handy for transportation. . The model ASG 32 by Tomahawk Design convinces in the air by an exeptional look and outstanding performance. It is a beauty and pure enjoyment for the glider enthusiast. The wing construction is made by carbonfibre , the top layer is fibre-glass , this meets highest levels of durability. The kit includes carbon reinforcements and is being produced using vacuum technology. The kit is well under 25kg in weight. We offer a wide variety of accessories like retract landing gear, cockpit, covers and others. The level of pre fabrication is fairly high. The kit offers multiple option to power the plane using different technologies. ASG 32 7,7m decals Different decals on request. Please send a picture as template. Related links to "ASG 32 7,7m FRP/Carbon version, (incl. airbrakes)"